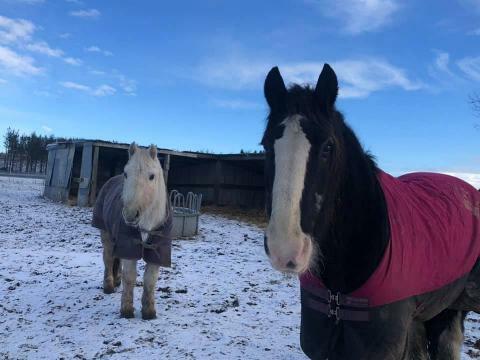 Bracken is a big happy boy who worked in the riding school when he first arrived and had many devoted fans as they felt so safe riding him. His former owner still donates generously every month and visits him whenever she is back in the area. He is now enjoying his retirement with his friends. He has a young sponsor, Chloe, who regulary travels fifty miles to spend time with him. He loves the hugs and attention. Recently, Eilidh, a member of Bracken's former family, made the following interesting remarks on our FaceBook page. We were delighted to learn more about his early life. 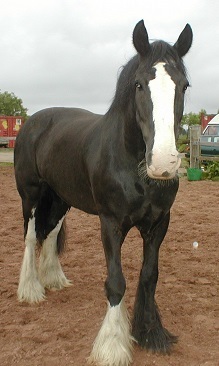 "We got Bracken from a riding school in 1996 I think and he was with us til about 2008. He was 6. We were told he’d been brought over from Ireland and had been neglected, left in a field with his tail in a bandage until his tail hair fell out. We also had a pony, Strawberry, and she used to beat him up. My sisters did show jumping and cross country with him and he would jump anything, no matter how scary. My dad used to ride him sometimes (like a sack of potatoes). He loved my dad and used to come galloping to the stables when my dad called him and would prick his ears up when my dad cheered him on around show jumping courses. Some people in the pony club didn’t like that, but I think they were jealous as he would get compliments at the horse shows. 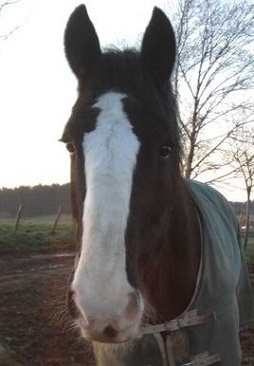 He had some other special skills like destroying his expensive rugs and getting poo in strange places in his stable. "